Home > Cooking, Eating	> Surprise! It’s Snails! Escargot aux nois, a photo by aghrivaine on Flickr. A while ago i was invited to a party at a friend’s – Sous Chef “Big Daddy” Poteete, in fact. I believe it was house-warming, or apartment-warming, though it might have been a birthday, it now eludes me. So I took the opportunity to prepare a “mystery dish” and bring it. Only after warming it on site, and setting it out in the incredibly appetizing form you see above – and being sure everyone tasted it, did I spoil the “guess the secret ingredient” game and tell them it was snails. In preparation, escargot aux nois Les Halles is fairly straightforward, and I think I managed the right flavor and consistency, though I think they could have used a bit more salt. In fact everyone who tried them enjoyed it, and went back for seconds generally, even after they found out what they were. So there you have it, Chef Bourdain – cruel tricks for dear friends that turn out to be pretty delicious. 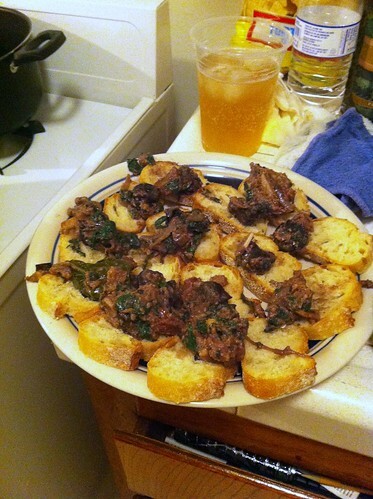 I’d definitely make escargot again, but given the cost of the main ingredient, the truth is it probably won’t happen. I have 48 tinned snails patiently awaiting the above fate. I trust that when you describe them as delicious you speak the truth, but really I am skeptical. They really are good! I made them both ways from the book, but I don’t think I have a picture of the other variety. But they have a not-unpleasant texture that’s sort of like baked eel that you might get in sushi. Coupled with the right sauce, it’s a tasty morsel. Would you give me some hint that you’re a real person, and not a spambot?